he CINEL ZA series Air Generators produce laboratory grade purified and hydrocarbon free air from an existing in house oil free compressed air supply or from our CZA oil free compressor, eliminating the need for inconvenient high-pressure gas cylinders. 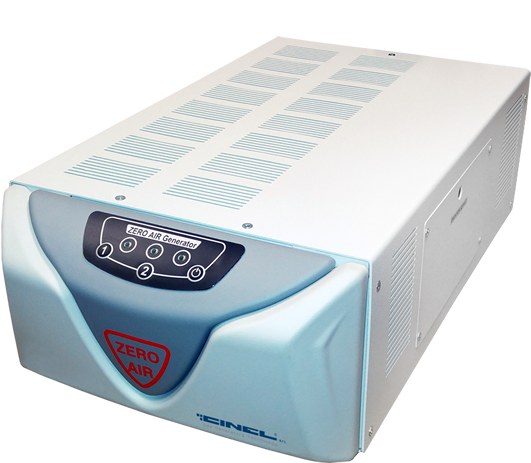 The CINEL ZA Series Zero Air Generators remove HC pollutants to less than 0.1 ppm, CO to less then 0.1 ppm and all kinds of particles. The system is designed to be a complete turnkey, is easy to install, and requires only minimal annual maintenance. The pretreated air passes through a coalescent filter to eliminate oil, water and the particles higher than 5 microns. The hydrocarbons including methane are removed by oxidation on a platinum/palladium catalyst heated at high temperature. A particle filter at the exit of the catalyst, makes it possible to eliminate the residual particles from outgoing flow.